2) DVD & other HDMI Devices. 4) Hi-Definition Quality Ensures Superior Signal Transfer. 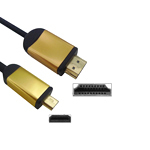 5) HDMI Version 1.4 with Audio Return Channel and HDMI Ethernet Channel,Internet-based equipment can share Internet access with other HDMI devices without any more Ethernet cable.High-definition TV transfer audio to A/V amplifier receiver by HDMI cable directly. 6) Definition of common 3D format and resolution.